Successful CEOs recognise data and analytics are key enablers to strategy, says David Bowie, managing director for SAS in Australia and New Zealand. 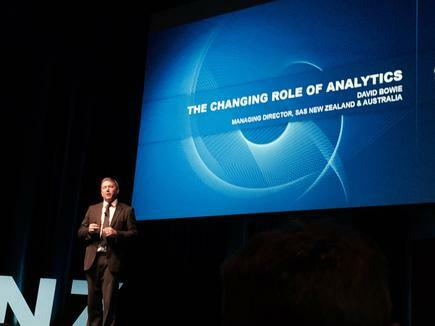 “Analytics is now a boardroom conversation,” says Bowie, in his keynote at the 35th SUNZ (SAS Users of New Zealand) conference in Wellington. “We are at a tipping point” when it comes to big data, he adds. He says there are various estimates around continuous growth of data, with one report forecasting 50 per cent annual growth of data all the way through 2020. This change is real, he says, and it is about leveraging analytics, not only to drive change but to survive. He says the disruption caused by big data is taking place across ever industry and company. But disruption can also be viewed as both change and opportunity. "Banks these days are technology companies"
This is exemplified by a recent conversation he had with the CEO of an energy company. Bowie notes how this industry is in the midst of massive change with wildly fluctuating oil prices. The CEO said the company had to fundamentally shift the way it thinks and acts and has to be much more accurate on using insights to make better decisions daily. He says it is not just big companies taking this stance. One of SAS A/NZ's customers is Football NSW (Australia), the NSW governing body for association and indoor football. The organisation administers 230,000 players in New South Wales. The CEO says using analytics is not just for the game but also for the experience people have and why they play it. The players register through the club portal, and Football NSW uses analytics to show a retail sponsor, for instance, where their stores are in relation to the large groups of players. Bowie also talks about how the All Blacks used analytics to determine its strategy that led to its victory in the Rugby World Cup. He relates this to banking, and invited the CIO of an Australian bank to watch the All Blacks play in Eden Park. “Banks these days are technology companies,” explains Bowie. The bank CIO noted the All Blacks experience of “creating a culture of high performance, aided by insights to be the best”. “No matter how big or small, insights you can get on a sporting team can help transform the business,” he quotes the CIO. He reminds the audience – more than 350 data professionals – that they are driving and enabling some of that change. He says it is important to fuel level of executive engagement to build awareness on the importance of analytics. SAS has also created an analytics advisory board to provide best practice advice across the end to end lifecycle of analytics deployment. This group, led by chief analytics officer Evan Stubbs, provides a trusted advisor relationship with New Zealand and Australian organisations SAS A/NZ works with. He says SAS is preparing for the next frontier in analytics, and the company is looking at key components around this goal. The first is to attract and retain the next generation of analysts and data scientists. The second is to support actionable analytics across a range of applications and new areas like cyber security. The third is a new modern analytics architecture that embraces open source and machine learning. “There is a massive skills shortage at all levels of data science – developers, data scientists and business users," Bowie points out. "It is fundamental to make sure we are developing future skills to drive productivity and growth." He says SAS is doing its best to address this problem, and one of these is to drive the adoption of analytics in university courses. In New Zealand, he says SAS has sponsored Massey University’s master of analytics programme. The agreement is the first of its kind with a New Zealand university and will provide students with SAS certification credentials, research funding and internship opportunities at some of Australasia’s largest firms. He says SAS has also launched an equivalent programme at the University of Melbourne’s business school. Professor Leo Paas, programme leader of the Business Analytics programme at Massey University, says the collaboration means students can be confident they will develop the skills needed by industry. “Our students will not only get a Master of Analytics but also SAS certification for many of its licensed courses. 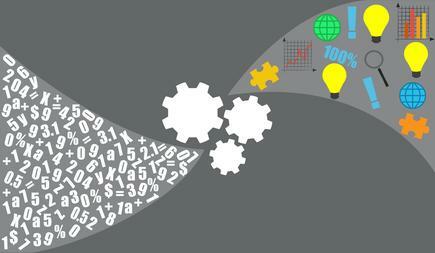 These are the most widely-used analytics software packages for big data applications and therefore highly sought after by employers,” says Paas. Paas says to become a master of analytics, you need a combination of skills that include maths, data and also the business in order to translate the results of analytical exercises to practical business decision making. "You need a combination of skills that include maths, data and also the business in order to translate the results of analytical exercises to practical business decision making." The students are first taught traditional analytical skills, such as data mining and statistics. The second semester is business specialisation in different areas like marketing, finance, and systems operations. Paas says the university is extending the programme to health analytics and public policy analytics. The students also get a “work placement to solve a real live business case within a company”. Paas says the programme should be multidisciplinary, so he is looking across other areas in the academe – marketing, computer science and public policy – and also with other companies. "We work with other companies, including banks and small Internet companies, to keep the course being practical and relevant," he says. 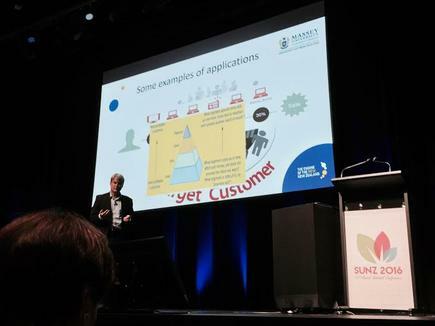 Divina Paredes attended the 35th SUNZ conference in Wellington as a guest of SAS.